…a room that smelled of paint. Faint voices, apparently in an argument, came from behind the locked door. They tried the door but, naturally, it wouldn’t open. The voices stopped when the doorknob rattled. The correct door here is 41, an odd number, and the other two door numbers are even. Maybe that’s what the symmetry/asymmetry thing is about here. The strangely-worded stuff about signaling approval and taking a short rest could be cluing the word NOD, which rhymes with ODD. Here’s what I think is going on with these doors. The door to 41 is the same as 14 but only one side of the French door is open. Once you go through this door, you’ll be in 41 and can get back to 1 and move on with your life. You don’t ever have to return to 10 again if you make the right choices next time. Some reinforcement comes from the volcano and the ballerina. When a volcano erupts, it spews all kinds of stuff into the air, including a bunch of ash. This ash can travel long distances but eventually most of it is going to fall down out of the atmosphere again. Note the sparks in the pic which are initially going up but then falling back down again. This is telling us — what goes up must come down. Or, if you go through this door, you’re going to have to come back again, even though you might end up wandering around in the Loop for a long time first. The ballerina is clearly pirouetting, meaning she’s making quick spins. 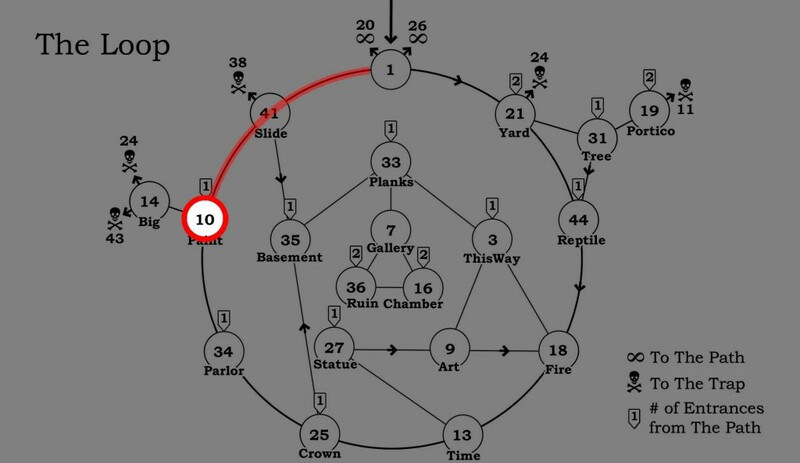 This is telling you that if you go through the door to 14, you’re just going to have to turn around really quickly and come back to 10 unless you want to end up in the Trap or the Abyss. Can we do something with 40 winks in here? It’s another way of saying “a short rest” and I guess you could see the double doors as “winking” with one door open and one door closed. This would work a lot better if the correct door were door 40, not 41. There’s a plus sign in the shadow of the ladder, so maybe you add the 40 winks from your nap to the final wink from the door to get 41. A nod is as good as a wink to a blind horse! I think the numerical order is a big problem in this room in my opinion because there is no clear indicator as to which comes first (or we haven’t found it yet). I’ve been toying with the idea of the volcano indicating upward, perhaps hinting to read the dancers as “top hat first, ballerina second” — but inconclusive because I can’t justify why. If the dancers are associated with the umbrella and baton, my theory would indicate 1 first, not second, botching the theory. The only thing I can think of involving the three in the “order” is that the man’s legs DO look like a 4, and the ballerina’s leg indicates 1. Combined with the volcano indicating upward, this works, but I think it’s still pretty weak. Yeah, although the ash from the volcano is coming down, and it might be raining where they’re going, suggesting downward movement…which doesn’t real mean anything, as loose as these clues are, except that you can still read everything both ways. you’re right. you could go up or down a ladder too. jeez. thanks vince. Thanks for the proofread, Beelzebibble. Despite my flip response to WR’s comment below, I have actually been thinking a lot about this room. I have come up with a little narrative that sort of fits what’s going on here. It’s not a very satisfying solution, but I’m kind of enjoying it, so I’ll put it here in case it sparks anything. Reading the room from left to right, we start with the bed and the dark tunnel-like entrance to 34. This is you in deep, dreaming slumber. Then you wake up — an event symbolized by the eruption of the volcano. But your eyes are still closed, as in the unnumbered door to 37. 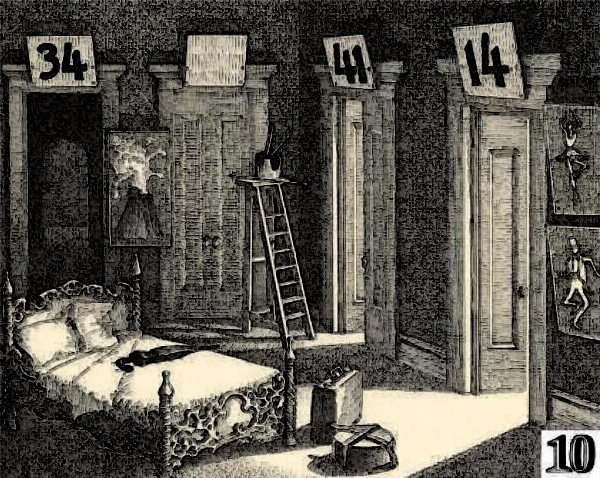 As you wake, you open first one eye (door 41), then the other (door 14). The light streams in and you are ready to grab your stuff and get on with your day. So the room is a metaphor for waking up, as reinforced by the double cluing of the word “nod” in the last sentence of the text, already pointed out below, I think by Vewatkin. The room is the inside of your head as you go from dreaming to waking. How does this point to 41. I don’t know. So that’s kind of a major weakness of the idea. But there it is. OK, so this is a solution that was discussed in the Mazecast but never posted here. It was vewatkin’s solution, I believe. Please correct me if that’s wrong. I like it, so I’m going to post it, but no credit for me if it turns out to be good. The entrances to all of the wrong doors are symmetrical. Door 34 has no doors at all (it’s just a doorway), the unnumbered door to 37 has two closed French doors, and the entrance to room 14 has two open French doors. The pillow on the right is propped up, not lying down in symmetry with its bedfellow. The bedclothes are open on the left side and closed on the right, just like the doors to 41. Both of the dancers have one leg up and one leg down. If “up” = open and “down” = closed, then the bottom dancer has his legs in a configuration that matches 41. And the ballerina will, in a second, because she is spinning. The volcano has sparks initially going up on one side and initially going down on the other. I think that the odd-one-in thing is correct given Manson’s love of the odd-one-in principle, but if you are like me you are thinking that this is too small a reason to have the doors like that, and you would be correct. There is another better reason that the doors are the way that they are so I am marking this solution as incomplete even though it isn’t…sort of…depends on your point of view. Here’s another odd-one-in for the doors. The three incorrect doors represent whole numbers: 34 is 2 (there are actually two doorways), no entry is zero, 14 is 1. Only 41 is a fraction, 1/2. In what surely must be a coincidence, 41 minus 14 = 20. 41 minus 34 = 7, + 14 = 21. Those two numbers average to 20.5, which is 1/2 of 41. Your odd-one-in idea is neat, though. That’s the “new math” everybody’s talking about! I think I meant 34-14=20, but what I REALLY meant was I am very bad at numerology. Any way to work the symmetry of “41 14″ into this asymmetry solution? Maybe it is as simple as this: all the door numbers are asymmetrical (two different digits), but all of the doorways are symmetrical except the door to 41. So the door to 41 is the only one where the doorway matches the door number. No solves for the room, just a clue as to the nature of the maze. The people heard themselves talking behind a door, suggetIng the odd passing of time in the maze (also mentioned by guide in different rooms). Also suggests alternate realities, parallel universes and all that type of stuff. Also, looking at the ladder, another 41. The rungs are attached to the two main poles on either side. The leftmost pole, the upper part of the left back pole, and the cross-section form a “4″, and the right pole is the “1″. In room 37, one of the doors rattles from the other side, so they suddenly stop talking! OK, how about this. The ballerina overlaps door 14. Her position shows that she is pirouetting, meaning she will be spinning around. If we “spin” 14 we get 41. I am a fan of this solution, makes total sense… watched the Mazecast last night and this was the highlight for me (besides my shout out). BTW, it’s five fifteen….but how would you guys possibly know that? Actually the song by The Who, I was listening to it the first time I posted. The Who: not a bad soundtrack for Maze. The Room 10 episode of MazeCast is up on the good old MazeCast dot com. As usual, I dislike every solution, Sara is drunk and disorderly, and SP gives a shout-out to his main man, Kon-Tiki. This is getting too emotional. I kon-tik it. So, the bed sheets are folded back to make 4 layers. If the layers correspond from left to right with the doors, the handle of the umbrella is on the 3rd layer, matching the 3rd door. Is the vol-CANE-NO saying do not pick the cane in room 34? I feel like this could have been mentioned before. My other thought was the ballerina’s tutu looks like an open umbrella, with her straight leg like the post. The sign painter has been interrupted (eruption). He has painted three signs but still needs to paint the FORTH ONE =41. If you take all the objects in this room as one image, they kind of make a 41… like the 4 font on the doors. Volcano pic is left top of 4, ladder is top right. Edge of the bed is the slant and cross. Luggage is the bottom stem. Dancer pics are the 1. Certainly not elegant, but kind of cool. Or the umbrella as the cross of the 4 works too. Is it intentional? Not sure, but it looks promising. I have added an image to Related Images to help others see it. I went for the umbrella, I see the other way but really couldn’t make it work graphically. Solution or not it is a nice find! Next week’s MazeCast will focus on Room 10. It has been a while since we did a general announcement like this, but with all the new blood around here it’s worth reiterating: Everyone is invited to join us for an on-air discussion of Maze, and those who’d prefer not to be on the show are entreated to turn their attention to this room and offer up what they can. We’ll summarize what solutions and suggestions are out there, suggests some new ones, and then probably complain about something petty and talk over each other for fifteen minutes. Aria, now known to us as Sara, joined us last time and it was great! She loved it! Honest! Tell everyone how great it was, Sara! The defining moment of a lifetime. There are a million ways to get in touch with us, but the easiest might just be dropping a message here, or contacting us on mazecast dot com. LIFE-CHANGING. I recommend it to everyone.